Before :- Kumar Rajaratnam and Manjula Chellur, JJ. For the Appellants :- H.S. Chandramouli and K.A. Chandrashekhar, Advocates. For the Respondent :- B.C. Muddapa, H.C.G.P., for SPP. A. Evidence Act, Section 32 - Indian Penal Code, Sections 302 - Murder - Deceased having 95% burn injuries - Dying declaration recorded by Executive Magistrate - Conviction could not be based on dying declaration particularly when there was no certificate of Doctor about fitness of deceased - Although fitness certificate is not required in law, but it would have been prudent considering the deceased had suffered burns to the extent of 95%. 2002 AIR SCW 3479 relied. B. Criminal Procedure Code, Section 318 - Indian Penal Code, Section 84 - Trial of accused who is deaf and dumb, but not of unsound mind - Merely because an accused is deaf and dumb but not of unsound mind cannot be absolved of his criminal liability if he is guilty of the offence with which he is charged - Deaf and dumb persons are liable to be punished for offences committed by them as any other persons - However, the trial Court is required under Section 318 to report to the High Court with respect to this aspect of the matter and to get on with the trial with respect to the other accused who do not suffer from any disability. 1963(2) Mys LJ 225 relied. (1) In such cases trial Court will proceed that accused was not pleaded guilty. (2) If the accused does not engage an Advocate, Court will engage an experienced criminal lawyer . (3) It is also permissible for the trial Court to secure the services of an Expert to communicate with the accused at the expense of the State. D. Criminal Procedure Code, Section 318 - Indian Penal Code, Section 84 - Trial of a person who is not of unsound, but deaf and dumb and cannot be made to understand proceedings of Court - Trial court is empowered to refer the matter of High Court when trial court gives a finding that prima facie offence has been made out - Once a reference has been made under Section 318, the High Court may pass such orders as it thinks fit - It may convict the accused or acquit the accused or direct re-trial. AIR 1960 Bombay 526 relied. Laxman v. State of Maharashtra, 2002(4) RCR(Criminal) 149 (SC) : 2002 AIR SCW 3479. Uka Ram v. State of Rajasthan, 2001(2) RCR(Criminal) 416 (SC) : 2001(5) SCC 254. Panchdeo Singh v. State of Bihar, 2002(1) RCR(Criminal) 126 (SC) : (2002)1 SCC 577. State of Mysore v. Hakaha and another, 1963(2) Mys LJ 225. State v. Radhamal Sangatmal Sindhi, AIR 1960 Bombay 526. Kumar Rajaratnam, J. - Cri. A. No. 479/2001 is filed by the appellants-accused Nos. 1, 3 and 4 against the Judgment of the trial Court rendered by IIIrd Addl. Sessions Judge, Belgaum in S.C. No. 85/1994, dated 17-3-2001 convicting accused 1, 3 and 4 for an offence punishable under Sections 302 read with Section 34, IPC and Section 324 read with Section 34, IPC. Under Section 302 read with 34, IPC, the accused were convicted and sentenced to imprisonment for life and to a fine of Rs. 5,000/- each in default to undergo S.I. for a period of one year. Under Section 324 read with Section 34, I.P.C., the accused were sentenced to undergo imprisonment for 6 months. The sentences were ordered to run concurrently. 2. Cri. R. No. 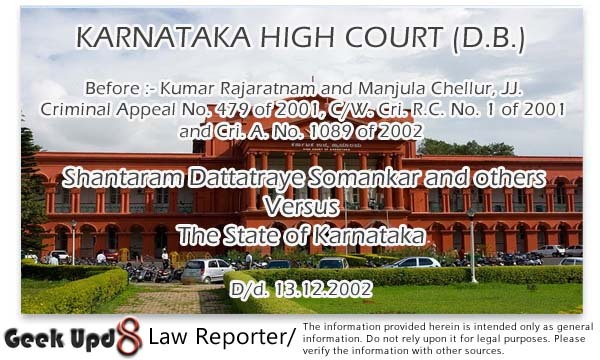 1/2001 is filed by the petitioner-the Registrar General of the High Court of Karnataka, Bangalore under Section 318 of Criminal Procedure Code on the judgment of the trial Court dated 17-3-2001 with respect to accused No. 2-respondent No. 2. At the stage of recording the statement under Section 313 of Cr.P.C. it was noticed by the trial Court that accused No. 2 was short of hearing, practically a deaf. Hence a reference on the report of the trial Court under Section 318, Cr.P.C. After the judgment, the accused No. 2, who was on bail during the trial has been remanded to judicial custody on 17-3-2001 and he is also in judicial custody since then. 3. Criminal Appeal No. 479/2001 is filed by A-1, A-3 and A-4. Criminal Referred Case No. 1/2001 is filed by the petitioner-Registrar, General of this Court with respect to accused No. 2. Apart from this A-2 who was convicted by the trial Court but not sentenced on account of the Criminal Referrred Case No. 1/2001 filed by the Registrar General is also before us with respect to the conviction and not sentence in Criminal Appeal No. 1089/2002. 4. There is a delay of 435 days in filing the Criminal Appeal No. 1089/2002. Heard the learned Public Prosecutor and the learned counsel for the appellant-accused No. 2. Considering the fact that the Reference No. 1/2001 with respect to A-2 is pending before this Court, after hearing the learned Public Prosecutor and the learned counsel for the appellant and in the facts and circumstances of the case the delay in filing the appeal is condoned and I.A.I. is allowed and we have after condoning the delay admitted Criminal Appeal No. 1089/2002. 5. Accordingly Criminal Appeals Nos. 479/2001 and 1089/2002 and the Criminal Referred Case No. 1/2001 are taken up together and a common judgment is rendered since the criminal referred case as well as the criminal appeals arise out of the same judgment and with respect to the same alleged occurrence. 6. The prosecution case, in brief, is as follows :- Deceased Venkatesh was the conductor on duty in the KSRTC bus bearing No. CAF 3502. P.W.8 was the driver on duty in respect of the said bus. On the night of 17-8-1993 the bus reached Sutagatti village and was parked near the society office, a little away from the village. The deceased and P.W.8 the driver were admittedly sleeping in the said bus on the night of 17-9-1993. The deceased was sleeping in the rear portion of the bus and the driver P.W.8 was sleeping in the front portion of the bus. 7. According to the evidence of P.W.8 who was the driver of the bus and according to P.W.4 who was co-conductor in the KSRTC bus deceased was suspended from his duties as a conductor. He was subsequently reinstated with backwages. 8. The bone of contention was the award of backwages. Sumitra the wife of the deceased was insisting upon the deceased that she should be given the back wages. However, the deceased Venkatesh apparently gave the amount received as backwages to his mother. This was not relished by Sumitra the wife of the deceased. It was further alleged that Sumitra being annoyed that her mother-in-law got the backwages committed the murder of the deceased's mother on 24-1992. A complaint in Crime No. 82/1992 was registered against Sumitra for an offence punishable under Section 302, IPC. The said Sumitra (wife of the deceased) was enlarged on ball and because of the estrangement started living with her brothers A-1 to A-3. It was further stated that Ashok and Ganapati are the minor sons of deceased and Sumitra. Both Ashok and Ganapati apparently witnessed the murder alleged to have been committed by Sumitra. It was further alleged that accused Nos. 1 and 3 and one Babu their relative kidnapped the two children from the custody of the deceased Venkatesh. A case was registered against the accused Nos. 1, 3 and one Babu in Crime No. 176/1992. It is also further submitted that A-1 and A-3 and the said Babu were acquitted by the trial Court by a judgment dated 7-9-1993. 9. On account of these two incidents Sumitra and accused Nos. 1 to 3 had nurtured deep enmity against the deceased and the deceased apprehended danger from the accused and his wife Sumitra. This appears to be the motive for the alleged occurrence. 10. Coming to the occurrence, the prosecution case is that about 3.30 or 4.00 a.m. some persons set fire to the bus, the deceased who was asleep woke up and informed P.W.8 that the bus was on fire. By that time, the deceased had already sustained burn injuries. 11. P.W.8 the driver had come out of the said bus and brought the deceased outside the said bus. Since the bus was (sic) burning P.W.8 rushed towards the Basaveshwar temple situated nearby and informed the villagers. An announcement was made through the loud speaker from the said temple calling upon the villagers to rush to the spot with water to extinguishing the fire. Many villagers including P.Ws. 1, 2 and 3 rushed to the spot and poured water on the said bus to douse the fire. 12. Venkatesh (deceased), the conductor had sustained burn injuries. P.W.8 the driver also sustained some burn injuries, with the help of the villagers both the injured persons were shifted to the nearby Government Hospital in the village. Thereafter, they were shifted to the Civil Hospital at Belgaum in a tempo. P.W.3 had accompanied the injured in the said tempo to the Civil hospital at Belgaum. 13. The prosecution case further was that the deceased had informed P.W.3 and other villagers who were extinguishing the fire that some persons who nurtured ill-will against him had set fire to the bus. P.W.3 had gone to the Nesargi police station from the hospital and presented a written complaint. The complaint is marked as Ex. P-1. The police had registered the said complaint in crime No. 63/1993. P.W.3 had also gone to the Taluka Executive Magistrate P.W.13 and informed him about the incident. PW.13 went to the hospital and in the presence of the medical officer P.W.13 recorded the dying declaration of the deceased between 10 a.m. to 10.30 a.m. on 18-8-1993. The dying declaration is marked as Ex.P-9. Injured Venkatesh had named the accused persons as responsible for the occurrence. 14. He had purportedly stated accused Nos. 1 to 3 are brothers of his wife Sumitra and accused No. 4 is the relative of accused Nos. 1 to 3. The accused persons were on inimical terms with him and, therefore, set fire to the bus in order to kill him. 15. Venkatesh succumbed to the burn injuries at about 7.15 p.m. on the same day i.e. on 18-8-1993. 16. Accused No. 1 was said to have made a voluntary statement as per Ex. P-20 and had pointed out the petrol bunk wherefrom he and other accused had purchased petrol. Inquest was held and statements of other witnesses were recorded. After completing the investigation the police filed charge-sheet against the accused for the offence punishable under Sections 302, 324 read with Section 34, IPC. "The deceased had extensive burn injuries all over the body and he sustained about 65 to 80% burns." 18. P.W.15 is the Doctor who conducted post-mortem examination on the dead body of the deceased on 19-8-1993. The post mortem report is marked at Ex.P.12. P.W.15 opined that the cause of death was due to respiratory failure due to shock as a result of extensive burn injuries to an extent of about 95%. 19. Ex.P-1 is the complaint given by P.W.3 to the Police. P.W.3 is a resident of the village and a Panchayat Member. He has stated that he heard a message over the loud speaker of Basaveshwar Temple situate outside the village. The message was that a bus was set on fire at the bus stop and people of the village should bring water and douse the fire. P.W.3 got up on hearing the message and ran to the spot where the bus was parked. 20. In the complaint he states that hundreds of people came there with water to house the fire. The rear portion of the bus was burnt. The Conductor- deceased Venkatesh came out of the bus. He noticed that his body was fully burnt. The right hand of the driver was also burnt. Since the conductor suffered severe burn injuries, P.W.3 took the conductor from the bus. Afterwards he and other persons from the village took the conductor and the driver in a tempo to the Civil Hospital at Belgaum. P.W.3 asked the conductor what had happened. The conductor deceased Venkatesh stated that some persons inimical to him had set fire to the bus with an intention to kill him. Apart from P.W. 1, P.Ws. 2 and 3 also sought information from the deceased. The deceased told P.Ws. 2 and 3 also that some persons who were inimical to him had set fire to the Bus. In the oral dying declaration, the deceased did not implicate the accused by name. 21. It is only at the time of giving the judicial dying declaration-Ex.P.9. the name of the accused finds a place in the statement of the deceased. 22. Therefore, the entire case of the prosecution rests on the dying declaration-Ex. P.9 given to the Taluka Executive Magistrate in the presence of Doctor-P.W.20. 23. P.W.20-Doctor has stated in his evidence that the deceased was admitted in the hospital on 18-8-93 and the condition of the deceased was getting deteriorated. He had suffered from hypolmic shock and respiratory distress and was under pain and agony. The deceased was admitted in the hospital at about 4.50 a.m. and Ex.P.9 was recorded at 10 a.m. P.W.20-Dr. Shivappa has stated that the deceased suffered 60% to 80% burns. But P.W.15-the post mortem Doctor has stated that the deceased had suffered 95% burns. 24. P.W.20-Doctor gave evidence without bringing any medical records of the deceased. He admitted that the case sheet of the deceased was available in the Civil Hospital disclosing the nature of treatment given to him. It was suggested to P.W.20 that he was not the duty Doctor and he was not the Doctor who gave treatment to the deceased. This suggestion was denied by P.W.20. No effort was made by the Court to request P.W.20 to make available the case sheet of the deceased. P.W.20, however has stated in his evidence nearly 7 years after the occurrence that the deceased was in a fit condition to make a statement. P.W.20 had not made any endorsement that the deceased was in a fit condition either in Ex.P.9 or a separate certificate was given to the Taluka Executive Magistrate before recording dying declaration. It cannot be ruled out that when the dying declaration was recorded at 10 a.m., there was further deterioration in the state of health of the deceased. 25. However, the evidence of P.W.13 the Tahsildar who recorded the dying declaration cannot be brushed aside easily. He has stated in his evidence that he went to Belgaum Civil Hospital at 10 a.m and met the Doctor-P.W.20. He enquired from the Doctor that the deceased was in a position to talk and only after (that) he recorded the dying declaration. He also states that he was satisfied about the mental condition of the deceased. He however did not record in Ex. P.9 that the deceased was in a fit condition to give a statement. 26. P.W.15 the Postmortem Doctor has stated that the deceased had suffered 95% burns and must have had severe burns while he being alive. He has also stated that in order to reduce the pain, the Doctor attending upon him must have administered a strong dose of sedation. He further stated that in such a condition, the patient would not be mentally fit to talk to anybody. The opinion of the Postmortem Doctor-P.W.15 cannot be brushed aside. 27. We must look at the timings in a chronological order. The alleged occurrence is said to have taken place at 3.00 or 4.00 in the morning on 18-8-1993, the deceased was taken to the local hospital and from there he was shifted to the Civil Hospital, Belgaum and was admitted in the hospital at about 4.50 a.m. The dying declaration was recorded at about 10 a.m. on the same day and the deceased died at 7.15 p.m., on the same day. It would have been perfectly possible to have accepted the judicial declaration Ex. P.9, but for the fact the earlier oral dying declaration given to P.Ws. 1, 2 and 3 only speaks of "those persons who were inimicaly disposed towards him". It is only in the light of this vital omission, we have carefully perused the evidence of P.W.15 the Doctor, who examined the deceased and was present at the time of giving judicial declaration. The dying declaration was recorded by P.W.13- Taluka Executive Magistrate. We have also carefully perused the evidence of Postmortem Doctor to verify for ourselves whether it was possible for the deceased to have mentioned the names of the accused in dying declaration. "Since the deceased had died due to burn injuries with about 95% of burns, he must have had severe pains while being alive. It is true that in case of the patient of the burn injuries, in order to reduce the pain, Doctors attending upon him administer sedative dose. It is true to suggest that if a patient is given with sedative doses he will not be in a position to respond and talk naturally. It is true that owing to such sedative doses, the patient will be in more drowsy state. It is true that in such condition the patient will not be in mentally fit condition to talk to anybody." 29. Both the Doctors admitted that the deceased was in a grave state of health and was being administered medicines. It cannot be doubted that the said medicine injected to the deceased must have been to relieve pain and prevent infection. 30. If the deceased had identified the accused as he got down from the bus, it would have been possible for the deceased to have named the accused to P.Ws. 1 to 3 (those witnesses who saw the deceased immediately after the incident). Even P.W.8 does not speak about the deceased mentioning the name of the accused. Another curious aspect of the case is that P.W.8 the Conductor brings the deceased from the bus along with P.W. 1. Neither P.W.1 nor P.W.8 mentions that any of the accused were running away from the scene of occurrence. It would have been practically impossible at the dead of the night for the deceased to have identified the accused. Whoever did this ghastly act must have scooted in the darkness. That is why P.Ws. 1, 2, 3 and 8 state that the deceased did not mention the name of the accused. If the deceased had identified the accused in the darkness, he would have mentioned their names to the witnesses who were present immediately after the occurrence. 31. Let us look at the picture for a moment as presented by the prosecution. The Conductor was sleeping in the front of the bus and the deceased was at the rear portion. Some persons came in the middle of the night and set fire to the bus. 32. P.W.8 who was sleeping in the front portion suffers burns and he rescues the deceased, pulls him out of the bus by the time the seat on which he was sleeping was burnt. It is clear from the narration of the prosecution case that P.W.8 and the deceased came out of the bus at the same time. There is no mention about certain persons running away from the scene of occurrence. It was a case of hit and run in the darkness of the night. That is why the deceased states that he has strong suspicion that certain people who were inimical towards him might have done this. Even when P.W.1 gave the complaint, the name of the accused does not find a place. If the deceased saw all the accused, it would have certainly found a place in the complaint. Therefore, it is clear from the medical evidence that the oral dying declaration must have been the truth and not much reliance can be placed on the judicial dying declaration given by the deceased. He was admittedly suffering from hypovolaemia which means a condition in which the volume of the blood in the body has diminished and was in a state of shock at the time when judicial dying declaration was given. 33. The Constitutional Bench of the Supreme Court reported in Laxman v. State of Maharashtra, 2002(4) RCR(Criminal) 149 (SC) : 2002 AIR SCW 3479 has pronounced that the absence of certification of Doctor as to fitness of mind of declarant would not render dying declaration as unacceptable. Certification of the Doctor is only a rule of caution and voluntary and truthful nature of the declaration can be established by other evidence. "3. The juristic theory regarding acceptability of a dying declaration is that such declaration is made in extremity, when the party is at the point of death and when every hope of this world is gone, when every motive to falsehood is silenced, and the man is induced by the most powerful consideration to speak only the truth. Notwithstanding the same, great caution must be exercised in considering the weight to be given to this species of evidence on account of the existence of many circumstances which must affect their truth. The situation in which man is on death bed is so solemn and serene, is the reason in law to accept the veracity of his statement. It is for this reason the requirements of oath and cross-examination are dispensed with. Since the accused has no power of cross-examination, the Court insists that the dying declaration should be of such a nature as to inspire full confidence of the Court in its truthfulness and correctness. The Court, however, has to always be on guard to see that the statement of the deceased was not as a result of either tutoring or prompting or a product of imagination. The Court also must further decide that the deceased was in a fit state of mind and had the opportunity to observe and identify the assailant. Normally, therefore, the Court in order to satisfy whether the deceased was in a fit mental condition to make the dying declaration looks up to the medical opinion. But where the eye-witnesses state that the deceased was in a fit and conscious state to make the declaration, the medical opinion will not prevail, nor can it be said that since there is no certification of the doctor as to the fitness of the mind of the declarant, the dying declaration is not acceptable. A dying declaration can be oral or in writing and in any adequate method of communication whether by words or by signs or otherwise will suffice provided the indication is positive and definite. In most cases, however, such statements are made orally before death ensues and is reduced to writing by someone like Magistrate or a Doctor or a police officer. When it is recorded, no oath is necessary nor is the presence of a Magistrate absolutely necessary, although to assure authenticity it is usual to call a Magistrate, if available for recording the statement of a man about to die. There is no requirement of law that a dying declaration must necessarily be made to a Magistrate and when such statement is recorded by a Magistrate there is no specified statutory form for such recording. Consequently, what evidential value or weight has to be attached to such statement necessarily depends on the facts and circumstances of each particular case. What is essentially required is that the person who records a dying declaration must be satisfied that the deceased was in a fit state of mind. Where it is provided by the testimony of the Magistrate that the declarant was fit to make the statement even without examination by the Doctor, the declaration can be acted upon provided the Court ultimately holds the same to be voluntary and truthful. A certification by the doctor is essentially a rule of caution and therefore the voluntary and truthful nature of the declaration can be established otherwise." 35. Reliance was also placed on the judgment of the Supreme Court in Uka Ram v. State of Rajasthan, 2001(2) RCR(Criminal) 416 (SC) : 2001(5) SCC 254. The Supreme Court held that before relying on a dying declaration the Court should be satisfied that the deceased was in a fit state of mind to make the statement. Once the Court is satisfied that the dying declaration was true, voluntary and not influenced by any extraneous consideration, it can base its conviction without any further corroboration. Any rule requiring corroboration is not a rule of law but only a rule of prudence. 36. In 2002(1) RCR(Criminal) 126 (SC) : (2002)1 SCC 577 (Panchdeo Singh v. State of Bihar) the Supreme Court pronounced that in a dying declaration. the deceased must evoke confidence of the Court that it was given voluntarily and in a fit state of mind and without being influenced by any extraneous influence. 37. Ultimately, it depends on the facts of each case. In this case we have the evidence of P.Ws. 1 to 3 and 8 about the oral dying declaration given by the deceased to the effect that the persons who are inimical towards deceased were responsible for setting fire to the bus. 38. We also have the judicial dying declaration. However, the judicial dying declaration does not inspire confidence in the Court, since the deceased suffered 95% of burns and must have been in a state of shock and under sedation. No note had been appended by the Doctor or the Taluka Executive Magistrate to have (sic) that the deceased was in a fit state of mind to give a declaration. Although that is not a requirement of law. It would have been prudent considering the deceased had suffered burns to the extent of 95%. The oral dying declaration does not implicate the accused. P.Ws. 1, 2, 3 and 8 are independent witnesses and the oral dying declaration given to them only refers to the persons who are inimically disposed towards the deceased. All the witnesses including the Petrol Bunk owner from where it is alleged that the deceased had purchased petrol did not support the prosecution. 39. In these circumstances we do not think that a conviction can be based solely on the judicial dying declaration which contradicts the oral dying declaration. 40. Accordingly the order of the trial Court is set aside and the criminal appeals stand allowed and the accused are acquitted for the offences for which they had been convicted and are directed to be set at liberty forthwith. 41. In view of our finding that the benefit of doubt must go to the accused the Reference by the trial Court under Section 318 of the Code has become academic. However, since submissions were made by Mr. Chandramouli, Senior learned counsel for the accused on this aspect of the matter we are inclined to say a few words on this subject, since such reference rarely comes to this Court. "318. Procedure where accessed does not understand proceedings. - If the accused though not of unsound mind cannot be made to understand the proceedings, the Court may proceed with the inquiry or trial; and in the case of a Court other than a High Court, if such proceedings result in a conviction the proceedings shall be forwarded to the High Court with a report of the circumstances of the case, and the High Court shall pass thereon such order as it thinks fit." 43. Section 318 prescribes that if the proceedings end in a conviction where the accused though not of an unsound mind is unable to understand the proceedings of the Court, in such event the trial Court may refer the matter to the High Court and the High Court shall pass thereon such order as it deems fit. 44. In this case, the trial Court came to the definite conclusion that on the basis of the evidence, A-2 is liable to be convicted. The trial Court came to know the fact that the accused was deaf only at the stage of recording the statement under Section 313 of the Cr.P.C. The counsel for A-2 informed the Court on this aspect of the matter only after the evidence was recorded. The trial Court also came to the conclusion that A-2 was represented by a competent Advocate and no prejudice was caused to the accused and the counsel for the accused ably cross-examined the witnesses. 45. What is the procedure to be adopted by the Court with respect to an accused who is not of an unsound mind but who is not able to understand the proceedings of the Court has been dealt with by a judgment of this Court reported in 1963(2) Mys LJ 225 (State of Mysore v. Hakaha and another). This Court pronounced that merely because an accused is deaf and dumb but not of unsound mind cannot be absolved of his criminal liability if he is guilty of the offence with which he is charged. Deaf and dumb persons are liable to be punished for offences committed by them as any other persons. However, the trial Court is required under Section 318 to report to the High Court with respect to this aspect of the matter and to get on with the trial with respect to the other accused who do not suffer from any disability. 46. It is also the duty of the trial Court in such cases to proceed on the basis that the accused has pleaded not guilty. If the accused does not engage the service of an Advocate of his choice, the Court shall make available to him the assistance of an experienced Criminal Lawyer from the Bar. It is also permissible for the trial Court to secure the services of an Expert to communicate with the accused at the expense of the State. The trial Court shall also make available to the accused such other necessary facilities which may be of assistance in securing a fair trial. Needless to say that if the accused is of an unsound mind, the Court must proceed under Chapter XXV of the Code. 47. Section 318 deals with an accused though not of an unsound mind cannot be made to understand the proceedings. Section 318 also deals only with the situation where such proceedings result in a conviction. There must be a finding by the trial Court that prima facie an offence has been committed and a further finding that the accused cannot be made to understand the proceedings. Only then, the trial Court is empowered to refer the matter under Section 318. It also follows that once a reference has been made under Section 318 the High Court may pass such orders as it thinks fit. It may convict the accused or acquit the accused or direct re-trial. 48. A Division Bench of the Bombay High Court reported in AIR 1960 Bombay 526 (State v. Radhamal Sangatmal Sindhi) held that there is a duty cast on the part of the trial Court to make an enquiry and to find out if the accused can understand the proceedings against him. If it can be shown that such a person has sufficient intelligence to understand the criminal law he is liable to be punished if convicted by the trial Court. 49. In Boya Polamma's case reported in AIR 1941 Madras 225 : (1941 (42) Cri LJ 315) it was held by the High Court that even it was not brought to the knowledge of the trial Court that the accused was deaf the conviction can be sustained if it can be shown that the accused was able to understand the proceedings. 50. In an old case reported in AIR 1947 All 301 the High Court observed that there was no provision in the IPC under which an accused can be exempted from punishment merely because he was deaf and dumb. 51. However, the Courts have to do their best to see that the trial against an accused is fair one and that he gets a chance of putting up such defence as he can have. 52. A Division Bench of the Kerala High Court reported in AIR 1959 Ker 165 in Pethambaran's case took the view that the provisions of Section 341 (old Code) can be invoked only when the accused is unable to follow the proceedings. The trial Court making the reference should record a finding as to whether the accused, though a deaf mute, had sufficient intelligence to understand the criminal character of the act committed by him. The Court must be satisfied that the accused is sane and that he has sufficient intelligence as to know the criminal nature of the act alleged to have been committed. 53. Therefore, if the Court finds that an accused is deaf and dumb the Court may proceed with the enquiry or trial. But it should first enquire into the antecedents of the accused and try and help him to understand the proceedings and render all possible assistance in the trial. 54. When a reference is made under Section 318 the High Court has got wide powers to enquire a fair trial and make a fair trial of the accused if it decides to proceed against him. If the Court trying such an accused shall be directed to see that he has the necessary legal assistance and the trial shall proceed on the basis that the accused has pleaded not guilty of the charge and all possible defences open to him, in the circumstances of the case should be considered. However, merely because an accused is deaf and dumb would not exempt him from punishment if it is shown that he has sufficient intelligence to understand the criminal character of his act and if found guilty. 55. As stated earlier we were obliged to refer the powers of the High Court under Section 318, Cr.P.C. since a reference had been made by the trial Court. In view of the appeals being disposed of on merits, no direction is necessary with respect to accused No. 2. Criminal Reference is disposed of accordingly. 56. In the result, Criminal Appeal Nos. 479/01 and 1089/02 are allowed and the accused are set at liberty forthwith.